Our experience in this industry spans more than 45 years. Brands include Hansen and Gromelle (previously Tuthill, now part of the Eaton Coupling Group), Rectus, Stucchi, CEJN, Snap-tite, Tema and Parker. We can supply (or interchange with) a number of other brands including Pioneer, Ryco, Faster, Safeway, Aeroquip, Eaton, Holmbury, Perfecting Service, Dixon, Nitto, Foster, Tomco, ARO, Intertraco, Inteva, Legris, Staubli, PBR, FCP, TCH, Frotek, Polypropylene, Haltec, PZB, Tuthill, Flowmax, Walther, Swagelok, Hy-lok, ERFF, PH, DNP, Manuli, Gromelle ERGO grip, and more! Two Way Shut Off couplings have valves in both the female and male halves to prevent any fluid loss on disconnection. Different types include ISO 7241-1 Series A (ISO A), ISO 7241-1 Series B (ISO B), Ag Series poppet and ball type, Tema (with AGA approval), Flat Face ISO 16028 (Dry Break Flat Face), Screw Together Couplings (Wing Nut and Flat Face), Hydraulic Jack (Enerpac type), Gromelle W6000 and European Screw types, Diagnostic couplings, Fire Rated BOP couplings, Cejn 115 and 116 high pressure couplings, Snap-tite H series, Snap-tite 71 series flat face and VV screw together poppet couplings. One Way Shut Off couplings have a valve in the socket (female half) only which prevents fluid loss on the supply end of a line. The plugs (male probes) are normally un-valved. These couplings are often used in pneumatic applications and also for breathing air lines. Safety Couplings (vented couplings, Cejn eSafe series) are available to reduce the risk of hose whip when accidental disconnection occurs. Unvalved Straight Through (full bore) couplings are designed for maximum flow with low pressure drop. Often used in pressure wash (water blast) applications and to conveying coolant to plastic injection moulding dies. Extras include dust plugs and dust caps, hydraulic check valves, Gemels hydraulic ball valves, hydraulic swivels, Cejn air and fluid blow guns and Flowmax colour coded fluid management couplings. Applications for our couplings are almost endless. 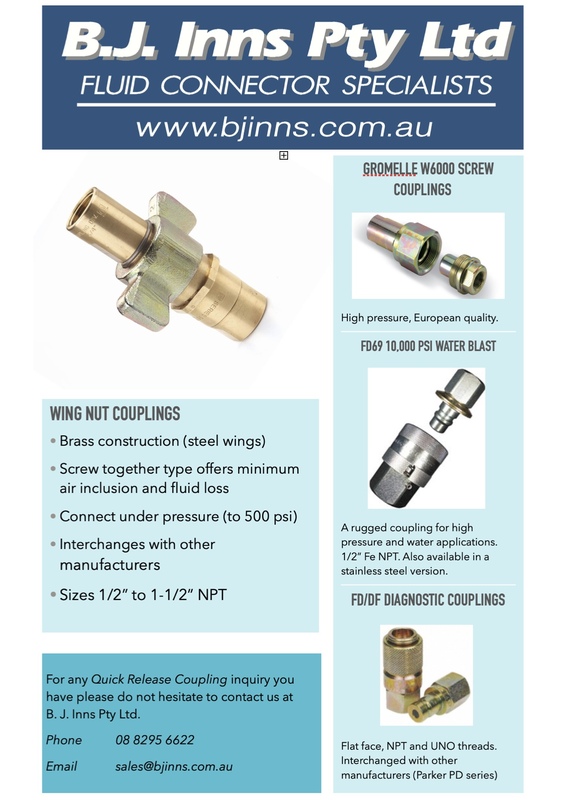 Whether your requirement is for High Pressure Hydraulic applications, Water Blaster, Off Shore, Carpet Cleaning, Chemical Sprays, Agriculture, Refrigeration, Injection Moulding, Diagnostic Couplings, AGA (Australian Gas Association) approved couplings, Rock Breaker couplings, Low Spill Dry Break type, Couplings for Medical applications or Vented Safety Air Couplings- we have the coupling for you!